The colors on this one are really nice. Although it’s a shag, the pile is low enough that it looks like it’ll be less susceptible to matting. Nourison Abstract Shag Blue/Grey Hand Tufted Area Rug - 7'6" x 9'6"
Nourison Abstract Shag Teal Hand Tufted Area Rug - 7'6" x 9'6"
Nourison Abstract Shag Blue Multicolor Hand Tufted Area Rug - 7'6" x 9'6"
Light as feather and just as soft, this sumptuous shag rug features fluffy microfiber shag pile with rich blue and grey abstract tones. Easy-care fibers are cut in a lower pile, making for easier cleaning and upkeep with all the luxury and coziness you expect in a shag rug. 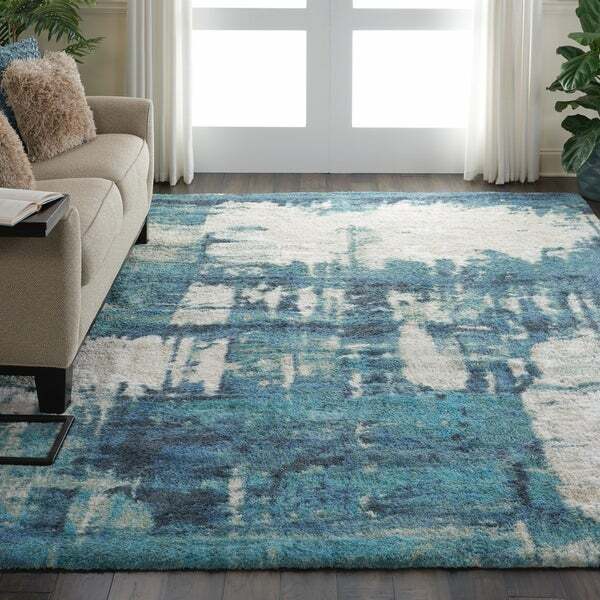 Nourison Celestial Ivory Teal Blue Abstract Area Rug - 7'10" x 10'6"
Nourison Prismatic Handmade Blue/Grey Wool Area Rug - 7'9" x 9'9"